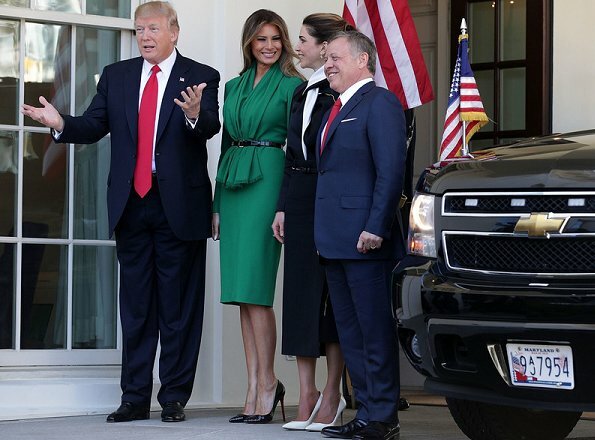 US President Donald Trump and US First Lady Melania Trump welcomed Jordan's Queen Rania and Jordan's King Abdullah II in the Oval Office of the White House on April 5, 2017 in Washington, U.S. US First Lady Melania Trump and Queen Rania visit the Excel Academy Public Charter School in Washington, DC. This must be very tense. Awkward. That is all I have to say. Lots to say but no politics here. Same for Rania. This high ponytail is a suitable hairstyle for a sixteen year old. How in the world can they walk on such high, skinny heels? Lizzie, melania is not a model anymore but no one can deny she has still a wonderful body and is in Perfect shape to be 46...come on, lets be true! ..and yet, you bring it in here. Melania is very elegant. Great color, too. I know the first lady is fluent in several languages as is the Queen. I wonder what languages they have in common. They definitely had a warm meeting and look great. English, of course. I doubt that apart from that, either one speaks a language the other knows, may French. English, of course. I doubt that apart from that, either one speaks a language the other knows, maybe French. Melania Trump speaks English, French, Italian, German, Serbo-Croatian, and her native Slovene. Queen Rania speaks English and Arabic. Melania, by many accounts, has quite a high IQ, as does Rania. Serbo croatian does not exist. Does Melania speak many languages the same way she graduated from University with a degree in Architectural Design? She lied about this for over a decade until she was exposed last year during the campaign. Wow, great entrance - both Ladies! Rania always carries herself with such natural grace. Looking good, ladies, although I´d prefer Rania´s dress like 10cm shorter and with an even hem. Trump disgusts me. Both ladies look lovely. I love that our first ladies can go toe to toe with any Queen, especially a Queen as fashionable as Rania. Melania has excelent sartorial chops, and really knows what colors suit her. More Melania please! I totally agree and I look forward to both Mrs. Trump & Queen Raina's fashion choices. I feel the same way. Mrs. Trump has made me very proud with this elegant, dignified, lovely dress. Both the Queen and Melania look stunning. The spanish press, that was totally pro Hillary, tries each day to convince its readers that Melania shuns to play her role as FLOTUS and that she's sad and depressed. If that is true she's a great actress, because she seems to be perfectly at ease in her new role. Haaaa! I live in NY. She is not at ease or happy. But that is all I will say. But maybe Diane met her in N.Y.? Diane, I am sure you wouldn't be happy or at ease in NYC with all those protesters rioting and destructing property. Come on, NYC is an amazing place. I have family there and visit often. I happen to live in NYC. I have no idea what protestrès you are talking about. Do you think there is an ongoing protest going on here Kteach? People did protest Trump during his inauguration and disgusting Muslim ban. Melania seems at ease to me too. The US press...especially the NY press!...may be selling us fake news that Melania is unhappy. She has not made one false move and was very gracious when Michelle Obama shunned her gift in front of the cameras. Carla what on earth are you talking about Michelle did not shun any gift that, that woman gave her. Michelle gave her a gift. Chelsea: melania brought a gift to michelle the day of the swearing. Actually @ Carla Michelle Obama did not shun Melania's gift. It is a long standing tradition of an exchange of gifts between the outgoing and incoming Presidents. However it is done behind closed doors. Not on the steps. I think Michelle did not know what to do ... it was not protocal. Maybe Melania did not know? Either way there was no shunning. This has been discussed repeatedly in papers. It was not an issue. No shunning. In fact it was the Obamas who warmly embraces Melania with arms around her when #45 left basically at the curb. That is actually why the looks on faces seemed awkward. You have a gift and a woman left hanging ... and btw when Melania offered the gift she stuck her hand out to shake and Michelle ignored the hand and instead hugged Melania with a kiss. Melania looks great, even though less hair by her face would be better. Rania has her hair up for a change and it looks fabulous, not so crazy about her clothes though. The top looks odd. I'm using the age odd adage: if you can't say anything nice, don't say anything at all. My only one comment is that I'm highly disappointed in the king and queen of Jordan. It seems like since day 1 of #45's "presidency" they have been kissing him and his family's bottoms. Chelsea, I guess they have no other choice in that big game to protect their home-country. And even Mr. Trump is no ruler but is ruled by others. Might have something to do with the financial aid Jordan receives from the U.S. government every year. Whatever the reasoning is, it's stupid. They have been with 45's family 3 times. How many times in the 8 years that President Obama was in office did they visit him? Shows their preferences. Queen Rania has worked very much for many progressive causes in her years as queen and she is always warm and natural. Even in formal settings she is confident and smiling. I didn't even recognize her in these photos. I frankly don't understand why the Jordanian royalty are in the USA? What is there in common with the current administration? Jordan and Queen Rania are actively working for women's rights, human rights, peace treaties, constructive international relations, and Jordan has been supportive of participatory democracy over many decades. In all these years they have not visited the USA? What is the tie with this administration that warrants a visit? The Excel public charter school has zero to do with the current administration: they have had nothing whatsoever to do with charitable interest in education especially for any African Americans and nothing whatsoever in Washington DC. Unlike Queen Rania who has championed causes for all needy Jordanians everywhere in her country. Queen Rania looks perfect in satin! Melanie is a beautiful lady and she always knows what colors and outfits look good on her, so does Rania. Both of them had a good visit and so did their husbands. Don't believe everything you read in the papers. Melania wears expensive and sometimes beautiful clothes, but you can't buy elegance, her hair and makeup are more appropriate for a Kardashian, I won't deny that many men may find her attractive, but there is absolutely no class, warmth or style in her demeanor, and by the way her language skills are a myth like her diploma in architecture, her English is acceptable period. Rania, white shoes really? her outfit looked dark and complicated at the same time, and it disappeared next to Melania's vivid green, although I will say that I prefer her hair on a pony tail rather than her usual dated style. Sur la dernière photo le visage de la reine est terrible : déformé et figé.Ces visages botoxés ne sont agréables à regarder que quand les dames sourient . 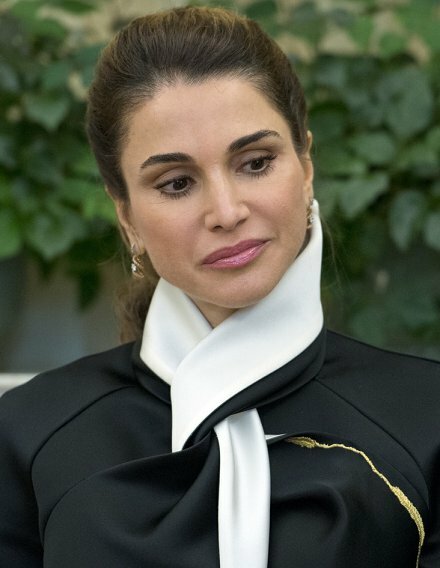 I like Queen Rania's hair and I don't find the style too young for her, I think it suits her bone structure. I actually would have liked Rania's outfit had it not looked as though it were badly sewn. It is a designer piece yet the raw seam looks unsightly to me as do the white shoes, black shoes in my opinion would have given the outfit a more polished look. I believe both the King and Queen would have done everything possible to make this meeting a pleasant event, although I cannot imagine either looking forward to meeting Trump after all of his anti-Muslim rhetoric (I am not being political, I am simply calling a spade a spade). As for Melania, I like her outfit, however she has an incredibly hard face and scowling all the time doesn't do her any favours. It's me, you just put your finger on what I have always thought of Melania: she does have a hard face. To me, she looks incredibly hypocritical. My nickname for her is Marie-Antoinette, for the way the Trumps flaunt their trashy, flashy gold-plated lifestyle in New York, and I wouldn't be surprised to hear her say: the peasants don't have bread, let them eat cake. To the Runner of the blog: i find it unfair and quite undemocratic to delete those posts that sound kind of critical to some readers comments. I would have expected more tolerance and some interesting debate, not just a simple erasing of what is "uncomfortable".BYE. She also deleted responses to those comments so all is fair. Probably the best thing to do. I should not go on in here. But unfortunately I always have to address words against me. I am ok w them and all of our replies being removed. I believe that's known as censorship. All i can say is that i only see as removed one comment of yrsterday complaining about too much criticism on here and my own reply of agreement with it. I dont see anything else removed.Thats why i call it unfair. Agree Grazia. Mine was removed as well while most of it was about the outfits but has a phrase of agreement like yours. My comment to that post was removed. I think that is best. Both were heated. Hellen did the right thing to me. On the a complaint, we have removed from this page a several comments. And it was deleted in the well meaning answers to these comments. (due to system structure.) We apologize. I think it was good to remove Hellen. No worries. Hellen: since i think the reader diane brown's opinion is worth as much as mine or someone else's , my advise is to let here all the comments (unless rude or offending) and see who agrees with who.Cutting is never a good idea if you want your blog to grow democractically. Melania is gorgeous. And poised wow!! Well, in my book this one goes to Melania. I generally love Rania for being daring in her fashion choices however this dress is just horrid, does nothing to her figure, is of a badly measured length and those white courts are just not right to finish the whole look. I don't find her ponytail a bad style however. Melania's dress is both interesting with the front pleating detail and elegantly modest, the emerald colour is gorgeous and suits her and I quite like that it has sleeves (the truth to be told, I never understood why Mrs. Obama wore sleeveless dresses so often, most of those were either too girlish or just plain unflattering for her frame). The only thing I'd change on Melania is that brutal black frame around her eyes. Really, her eyes aren't that small, such heavy contours are just unnecessary. I think that Melania Trump looks elegant and dignified here. Her dress is beautiful, her grooming is impeccable, and I am proud of her. I suspect that many of the unkind remarks that have appeared here are from people who would prefer for Mrs. Trump to be gauche and a disappointment, when she so clearly is neither. I am so glad to see these two beautiful ladies together. They both represent their countries admirably. Late to comment, ..but I will just the same. Melania looks like Katlyn Jenners....or the other way around? Compared to Queen Rania, Melania doesn't look like her statuesque self, she looks quite large and over bearing. Her outfit is acceptable. Queen Rania looks elegant and sophisticated. I'm sure it was an awkward yet necessary meeting.